Before Meghan and Harry, another American 'princess' captured the hand of an English aristocrat. 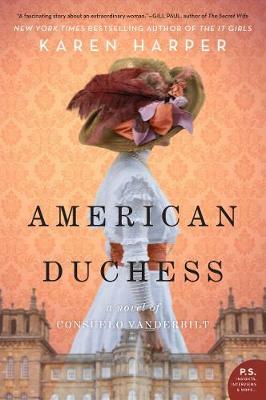 Now, Karen Harper tells the tale of Consuelo Vanderbilt, her The Wedding of the Century to the Duke of Marlborough, and her quest to find meaning behind the glitter and the gold. On a cold November day in 1895, a carriage approaches St Thomas Episcopal Church on New York City's Fifth Avenue. Massive crowds surge forward, awaiting their glimpse of heiress Consuelo Vanderbilt. Just 18, the beautiful bride has not only arrived late, but in tears, yet her marriage to the aloof Duke of Marlborough proceeds. Bullied into the wedding by her indomitable mother, Alva, Consuelo loves another. But a deal was made, trading some of the vast Vanderbilt wealth for a title and prestige, and Consuelo, bred to obey, realizes she must make the best of things. At Blenheim Palace, Consuelo is confronted with an overwhelming list of duties, including producing an heir and a spare, but her relationship with the duke quickly disintegrates. Consuelo finds an inner strength, charming everyone from debutantes to diplomats including Winston Churchill, as she fights for women's suffrage. And when she takes a scandalous leap, can she hope to attain love at last...? From the dawning of the opulent Gilded Age, to the battles of the Second World War, American Duchess is a riveting tale of one woman's quest to attain independence--at any price.